Haas F1 Team today launched their first entry into the world of Formula 1. The car – dubbed the VF-16 – lacks a title sponsor as such, but is emblazoned with Haas motifs and also shares with McLaren the backing of luxury watchmaker Richard Mille. The new machine, launched via Haas’ Twitter account. It’s the first F1 team from the USA since 1986, when another outfit calling themselves Haas (Team Haas Lola, backed by Carl Haas who is of no relation to Gene) raced, boasting drivers Patrick Tambay and Alan Jones. 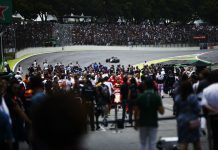 However, after the money ran out, the team bid adieu to F1, leaving the sport without an American outfit for three decades. 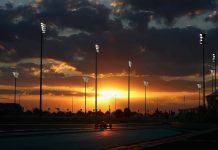 It nearly happened in 2010 with the ill-fated USF1 team, but finally, Formula 1 has another squad of racers from America. Gene Haas knows a thing or two about running a racing organisation, with his NASCAR outfit Stewart-Haas sweeping up five victories in the Sprint cup last series through Kevin Harvick and kyrt Busch. You can expect this one to go a little better than USF1, then. The sleek silver middle keeps things fresh, with a subtle hint to Banbury’s past in red and black. It’s the first F1 car to come of out the Banbury base since Marussia relinquished the facility to Haas in December 2014, who subsequently moved to Dinnington. Red and black must be in the water in the Oxfordshire base, because the car does bear some resemblance to Marussia cars of the past, with black and red features contrasting against red detailing. The livery is a smart combination of a silver monocoque sat on top of a black base, with red highlighting the nose and the endplates of the front and rear wings, so while the fundamental colours are similar to those of McLaren and Manor, confusion should be avoided. Notable features include a small bulge above the front suspension, and the seemingly-universal ‘Size Zero’ rear end. Romain Grosjean continues to pronounce his new employers’ name “Arse”, but nonetheless, the Frenchman can’t wait to get started in the new team, and will be giving the car its first outing on the first day of testing; Monday 22 February. He will step aside for the second day, before returning on Wednesday. Esteban Gutierrez, who will race for the first time since the driver merry-go-round at Sauber at the end of 2014, will pilot the VF-16 on Tuesday and Thursday. The car’s first true outing actually occurred on Saturday, the day before launch, when the team toured the Circuit de Barcelona-Catalunya for one lap to gain some footage. In true US Hollywood spirit, the film comes complete with inspitational music and an Instagram filter.